The most immediate (but not the only) water quality problem facing the Assabet River is nutrient pollution. We know the most about the Assabet because an in-depth study called a TMDL was done to determine the cause of its nutrient pollution. In the summer, parts of the Assabet River are as green as a well-watered lawn. The green is a blanket of floating duckweed and algae, and beneath that hides a forest of aquatic plants rooted in the shallow sediments. This excess of plants, termed "eutrophication," is caused by an over-abundance of nutrients (mainly nitrogen and phosphorus) in the river acting as fertilizer for the aquatic plants. During the growing season the overgrowth of plants creates problems for fish and other aquatic creatures by affecting dissolved oxygen concentrations and pH in the water column. After the growing season, the plants and algae decay, lowering dissolved oxygen levels and producing that distinctive bad odor you probably associate with late summer along the Assabet if you've walked by the Powdermill Dam on Rte 62 in Acton or along Track Road by the river in Maynard. The excess of nutrients and the effects of eutrophication have impaired the river to the point that it does not meet the state's water quality standards for a "fishable and swimmable" river. The bulk of the nutrient loading to the river comes from the four major wastewater treatment plants that line its banks. Storm water runoff and the recycling of nutrients trapped in river sediments also contribute to the river's excess of nutrients. Dams all along the river create large, slow moving sections (impoundments) where nutrient-rich sediments have accumulated over many years. Before the river can meet "fishable and swimmable" standards, nutrient loads from the wastewater treatment plants and nonpoint sources will need to be dramatically reduced. 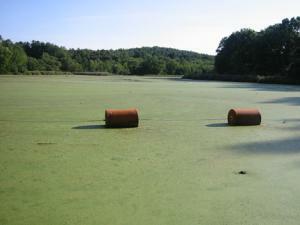 Much of the study of the Assabet's eutrophication problems has concentrated on phosphorus because phosphorus is usually the "limiting nutrient" in freshwater systems. That is, it is the critical nutrient that will get used up first and limit the amount plants can grow. Read about the sources of nutrients and other water quality problems: wastewater, dams and sediment, and stormwater. Read about the state's system of listing impaired waters. Or jump right to the technical details of the TMDL study of the river's nutrient problems.